Toshihide Migita (1863-1925) Ichikawa Danjuro IX as Kato Kiyomasa, 1893. Oban. This is a phenomenal portrait by any standards. 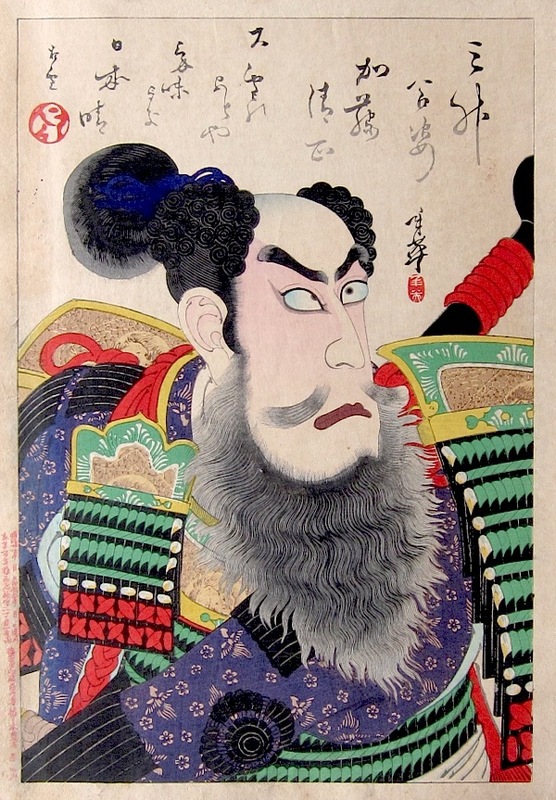 Once again it is Ichikawa IX depicted, here in the role of the famous Japanese warlord Kato Kiyomasa. Kiyomasa was a daimyo of the sixteenth century and instrumental in the seven year Japanese wars with Korea. He is known to have been fierce, brutal and fearless but was also a cultured man; a Buddhist and a poet. Toshihide shows him with elaborate hair, curled and braided, and tied in a samurai topknot. The effect of this, the eyebrows and the unruly beard dominates the print. Elsewhere, in the armour, the sword pattern again dominates, adding to the startling frankness of the image. This is the strongest piece in the series, bold and complex and a great portrait of the great actor. A similar - although less dramatic - portrait of Danjuro in the same role by Kunichika shows the same performance but in a markedly different light. Ichikawa Danjuro IX (Sansho) dominated the kabuki scene at the end of the nineteenth century. The bulk of kabuki portraits of any quality tend to be of Danjuro in his notable roles - a deliberate policy of the the actor and the theatres to keep the now flagging kabuki scene alive. The most famous of these homages is the great series 100 Roles of Ichikawa Danjuro by Kunichika from the late 1890’s. These portraits by Toshihide from 1893 predict that series in style and composition. These are terrific prints, some of the best works of Meiji Japan and although this series and the others in this show by Ginko and Kiyotada are rare, they deserve much greater recognition. Drawn in a traditional style, these dramatic prints owe more to Kunisada, Yoshitoshi (who was his teacher) and to Kunichika than the western influence that he was to work under for most of his career. The print is full size with margins, fine impression and colour and in very good condition. Some wear to lower left.